What AA Taught Me • Run Hard. Rest Well. More than three decades ago I attended my first open AA meeting with someone I loved. I was only 16, but it changed my life. There I sat, for the first time in my life, with a group of people lacking all pretense. The room was filled with real people! Masks had been discarded. Transparency and authenticity reigned. It was a safe place and I was mad. “Why is the church not like this? !” I thought. “It should be the safest place there is to be real.” But I knew in my heart, that for most people, it was the last place they would choose to be real. Even as a teen, this truth made me sad and mad. The definition of pretense . . .
An attempt to make something that is not the case appear true. The definition of pretentiousness . . . Attempting to impress by affecting greater importance, talent, etc than is actually possessed. Pretense and pretentiousness smother our souls. They add to our heart, an unbearable burden. Healing becomes the gift we embrace and the gift we can share. We pray for safe people and safe places for us today. We are tired. We pretend, all too often, that everything is OK when it is far from the truth. No rest can be found in this place, no rest for our weary, wounded soul. Jesus, we need a safe place to let down our guard. Pave the way. Pave the way today. If you have 3-4 minutes to read a winsome, stunning real-life story, it’s only a click away. 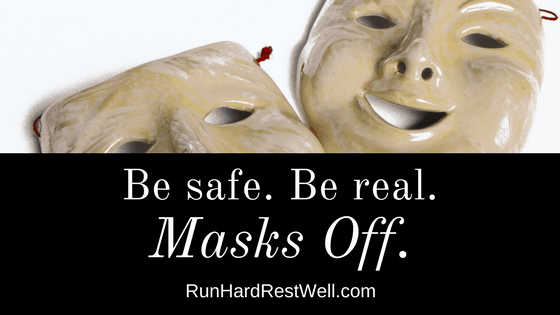 Where and with whom do you lay down your masks? Wow. Thanks, Brenda. You are so right. Thanks also for the link to that story. It convicted me to finally apologize for a judgement I made behind someone’s back. Please keep writing. Karen, Your encouragement blesses me. We’re running this race — together! I love our readers – our team! God has brought us together. For a reason! Oh, Brenda, so often I just want to scream…..my life is falling apart and I really don’t want to do life any more. But….I get up….I smile, I love, I move forward…what else can I do? I could give up and not go anywhere or do anything….except sleep, but that’s not the answer. So…..I go forward and love the way Jesus asks me to love. I give the way Jesus asks me to give. I’m present in the hear and now, because someone needs me to be there. Things aren’t that bad….not really. It’s just there are so many things and I’m so very alone. Don’t feel sorry for me. Don’t feel bad. I try to be real, but not everyone can take real. I try to share, but people get up in arms. I am loved. Jesus is with me. He doesn’t ask anything of me that He doesn’t give me the grace to act on. He doesn’t ask anything of me that He hasn’t first walked through. When I act out and try to make myself feel good, I suffer. Food is my downfall. My mouth is my enemy. But I get up, I move forward, and I know….. I know that Jesus is with me and He will fix all this….maybe not today….but He will fix it…fix me….and there will be joy I’ve never tasted before. With masks off — we move on. Run Hard. Rest Well. equips people to embrace a pace and passion for work and rest that is biblical, transformative and sustainable.